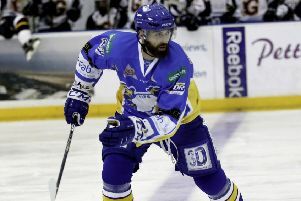 Fife Flyers defenceman Russ Moyer is desperate to turn the tables on rivals Braehead Clan after suggesting they are more motivated against the Kirkcaldy team than any other. By their own standards, Clan have had an indifferent season so far, but have collected four wins from a possible five in matches against Flyers - a sequence that has put them 11 points ahead of the Fifers in the Gardiner Conference standings. Flyers will look to eat into that deficit when they travel to Braehead Arena tomorrow (Friday), but to do so, Moyer insists they must find a way to counteract an outfit that seems to be saving its best for the fixture. “They have a solid attack,” Moyer said. “They play four lines against us and they just keep coming. “That being said we’re in there every game with them. “From what I’ve heard, they get up for our games more than they get up for anyone else. “They’ve had issues playing against other teams but seem to always find their ‘A’ game against us. Moyer was speaking after a weekend that saw Flyers take one point from a possible four - losing at home to Braehead on Sunday after a penalty shots defeat in Manchester on Saturday. “It was disappointing,” he said. “Out of the six periods we played fairly well for four of them but obviously that’s not good enough to get all the points you want. “We’ve been trying to do all we can around here and hopefully somehow we can right this ship - and I’m sure we will. “We’ve got a lot of the right guys in here so it’s just a matter of time before we start putting it together. Flyers have endured a season of instability so far with key injuries impacting right throughout the line-up, and Moyer admits that playing short-handed most weeks has taken its toll. “It’s always difficult when you’re missing important guys but, that being said, there was opportunities for guys to step it up,” he said. “For the most part they have but it’s tough when you’re playing short-handed and playing two-and-a-half lines against four line teams. “We’ve done a good job for the most part but we seem to have trouble finishing off games. After losing seven of their last eight, Moyer admits that a victory is required to release some of the frustration building among the fans, and in the dressing room. “We’re looking for a win and we’ll try to do everything we can to get that win in Braehead on Friday,” he said. “We’ve got to put our previous games behind us and move on. When we’re doing the right things we’re successful. When we try to cut corners it doesn’t work - it’s a recipe for disaster and we’ve proven that.